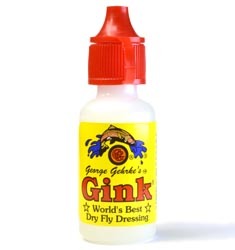 Gink is a light paste that turns to a liquid at skin temperature. Upon contact with cold water it returns to a clear, unseen, invisible gel that keeps water from penetrating and sinking your dry flies. It has no smell or odors and leaves no oil slicks as other dressing do. It is has been our most popular floatant for years. Gehrke's XINK® is a unique product which is essentially wetter than water without washing off. Just a little dab on your favourite wet fly will take it down below the surface and keep it there. XINK® will also sink most tippets and leaders and works great with Maxima. Its creamy consistency flows easily in cold weather, making it easy to apply and ensuring that it won't mat delicate hackles. It contains no solvents. This holder clips anywhere and allows floatant to be dispensed using one hand. The suction-cup cap holds floatant securely in place and fits most 1/2 oz. bottles. Aquel is long lasting, silicon based and won't melt when it's hot or harden when it's cold. Furthermore, it masks human odour and won't leave any slick on even the calmest water. Flies treated with Henry's Sinket quickly break surface tension and rapidly drop in the water column to where the fish are. It's especially effective on streamers, getting flies down on the first cast rather than waiting until the materials become saturated. Henry's Sinket is completely biodegradable. Watershed is a pre-treatment floatant which claims to permanently waterproof your dry fly. It must be applied before use and allowed to dry for at least 24 hours. It has a thin and watery consistency to ensure thorough saturation with just a couple of drops. Hydrophobic powder for dry flies. A liquid, silicone-based dry fly floatant in a convenient pump-spray applicator bottle. Dries quickly and won't mat down delicate hackles.